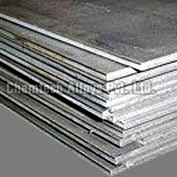 Chemtech Alloys is one of the leading Manufacturer, Exporter and Supplier of Monel Plates. Our proficiency lies in offering an extensive range of Monel Plates that are useful in several industries. We manufacture the Monel Plates using high-grade raw material and advanced techniques. Right from the procurement of raw material to the final packaging, the Monel Plates, we manufacture, undergo strict quality checks at all stages. The Plates thus, have high stiffness and consistent mechanical properties.